You have to be careful with North Americans. Just because they look like somebody from your street doesn't mean they think the same. It's easy to offend. So when Ryan, a mature student Susan's niece has brought home for the holidays, tells me Ringo was useless - a story I've heard a hundred times - my sensitivity to cultural difference means I treat this Canadian character gently. "You cannot be serious," I say. A look of disapproval flits across his face, before he delivers the well-worn support for his nonsense. "You know what John said, when asked if Ringo was the best drummer in the world?" he says. "Of course: 'He isn't even the best drummer in the Beatles.'" "There you are then," he says, throwing a complacent leg over the arm of his chair and getting a disapproving look from Susan. "You're failing to appreciate something quite important though," I tell him. "Enough about drumming," Susan says, giving me the look. "Everyone to the table." I bide my time during the starter, trying to judge a safe moment to resume. He gets in first, lowering his voice to ensure she's just out of earshot, bound for the kitchen. "If the bass player was the best drummer in the Beatles it doesn't say much for Ringo," he says. "He wasn't," I tell him. "Paul was good. He could play anything - guitar, drums, piano, fiddle, sax, spoons, washboard. But listen to Back in the USSR with Paul on drums. Then try Ringo on Rain or his lovely shuffle groove on Tell Me Why. 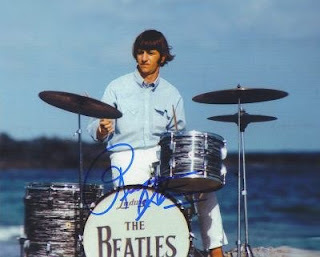 "Ringo was a musical drummer. He played the song. He wasn't flashy. He was creative, distinctive, and one of the most influential rock drummers who ever lived. Yet here you sit in my living-room with a faceful of my prawns, telling me he's useless." "Whose prawns?" Susan demands, having sneaked up behind me. "Whose living-room?" "Didn't I tell you to be nice to our guests," she says. "But he was being nasty to Ringo." She puts her arm round my shoulder and pulls me close. "Shove distinctly autistic Douglas back in his box," she says. "Then bring out sophisticated Doug and engage our guests in friendly conversation." She squeezes my shoulder and departs to bring in the main course, and I glance at Ryan, who looks expectant. "So you're from Canada," I say. "Home of Keanu Reaves, Leonard Cohen and Pamela Anderson," I say. "So I believe," he says. "Are you enjoying Scotland?" I ask. I feel like a tennis player whacking bouncy balls over the net and getting wet socks lobbed back at me. The temptation to return to Ringo is strong. No sign of main course or Susan yet, so I risk it. "Who is your favourite drummer then?" "Ha! I knew it. All fast hands, flashy solos and technical virtuosity." He reaches for the decanter to pour some more of the Merlot. "Let me get this right," he says, displaying an unexpectedly Old World gift for sarcasm. "Your theory is that being able to play your instrument well is a handicap to a musician?" "I fancied emigrating to Canada when I was young," I tell him. "Really?" he says, as Susan returns bearing a large roast on a platter in both hands. "Canada's loss. What changed your mind?" "I met some Canadians," I say, and Susan somehow slaps me on the back of the head.